'Habit' can be as important as contractual terms in determining when your customers pay you. If a customer knows they are not chased until several weeks after a month end they will often drag out their payment. Streamlining your credit control process can help. Credit HOUND can help you to automate and accelerate the chasing of overdue payments raising your profile with customers in a professional manner and push your balances up their payment schedule. You can set up business 'Rules' to ensure that credit HOUND matches your chosen style of dealing with customers. The invoice has not been received. The invoice is disputed in some way. removing these barriers will speed up the collection process. credit HOUND can be set up to issue letters, faxes, or e-mails, in advance of items becoming due. For example, you could issue a notice 5 days before a month end of the balances expected to be paid at the month end. This can help ensure that any missing invoices are identified as soon as possible. Credit HOUND's dispute handling and resolution support can help resolve disputes more rapidly, working across finance and other departments, to clear invoices ready for payment. Using tabular and paper reports can be burdensome. Providing clarity on the current position is key in ensuring effort is focussed on key balances. Credit HOUND's graphical reports show at a glance the overall status of total customer balances (not yet due, in query and overdue), and split across key customers, and can help you set the focus of your efforts. Data is synchronised on a daily basis to ensure your credit controllers are acting upon the latest information. Once an invoice is overdue accounting systems can 'lose track' of an item's status. This leaves the process of scheduling next steps down to the credit controller's memory and diary skills. This can be inefficient and leads to the risk of missed follow up actions. 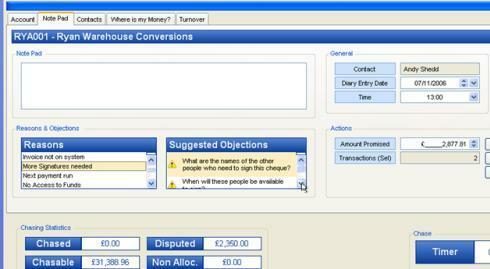 As an integrated system credit HOUND allows you to fully record the discussions you have with your customers. During a call you can use credit HOUND to update an expected date of receipt and schedule the timing of follow up actions in an integrated diary system. If an invoice is paid in the meantime the diary reminders are cleared, if the item remains open automatic reminders will be triggered. 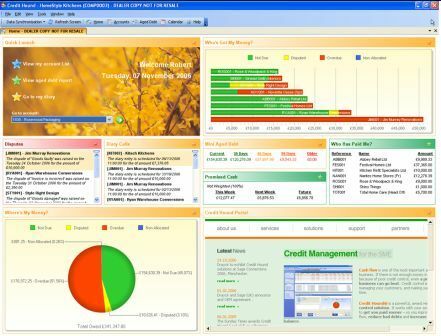 Credit HOUND is preloaded with typical reasons for invoices becoming overdue and prompts your controllers to question the customer and gather appropriate extra information, such as cheque number and amount for items 'in the post', to ensure best practice operates across all the members of your credit control team. Some small businesses do not have a dedicated or full time credit team but this typically heightens the need to tighten processes. A small business can use credit HOUND to automate the issue of reminders and notices leaving them to focus on the other areas of their business. In this scenario it is recommended that emphasis is placed on the timely allocation of receipts to ensure customers are not chased for payments already received.